Kyiv secured the release of 73 Ukrainians. Ukraine has exchanged 233 prisoners for 73 persons held by pro-Russian militants, the spokesperson for the Prosecutor-General's Office, Larysa Sarhan, said on Facebook on 27 December. There have been no exchanges for about a year. "Of all people we have recovered from the uncontrolled territory, one woman refused to return. She said that she has pro-Ukrainian views but her family is in Donetsk therefore she is staying," Sarhan quoted Deputy Prosecutor-General Anzhela Stryzhevska as saying. She said that 26 people requested by the militants refused to go. 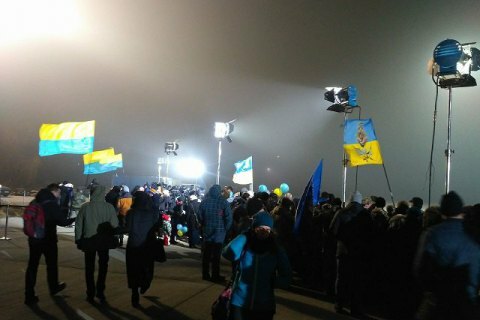 The released Ukrainians were taken by buses to Kramatorsk, where they were met by President Petro Poroshenko, then to Kharkiv airport and then flown to Kyiv where they were welcomed by at least 500 people at the Boryspil military airfield, according to an LB.ua correspondent. The Kyiv public transport (Kyivpastrans) company provided buses for those willing to greet the released Ukrainians. Among the ex-captives are Luhansk Zorya football club fans Vladyslav Ovcharenko and Artem Akhmerov, whom militants had sentenced to 17 and 13 years in prison for "spying for Ukraine, Valentyn Bohdan, Eduard Nedelyayev, and theologian Ihor Kozlovskyy.